CreatureKind Communities distinguish themselves as places where people want to learn more about animals as a faith concern, and take action to improve practices related to farmed animals. Universities, denominations, individual churches, and organizations can all work with CreatureKind to raise awareness and improve community food practices. Students and staff at Southern Adventist University formed a CreatureKind student group in 2016. 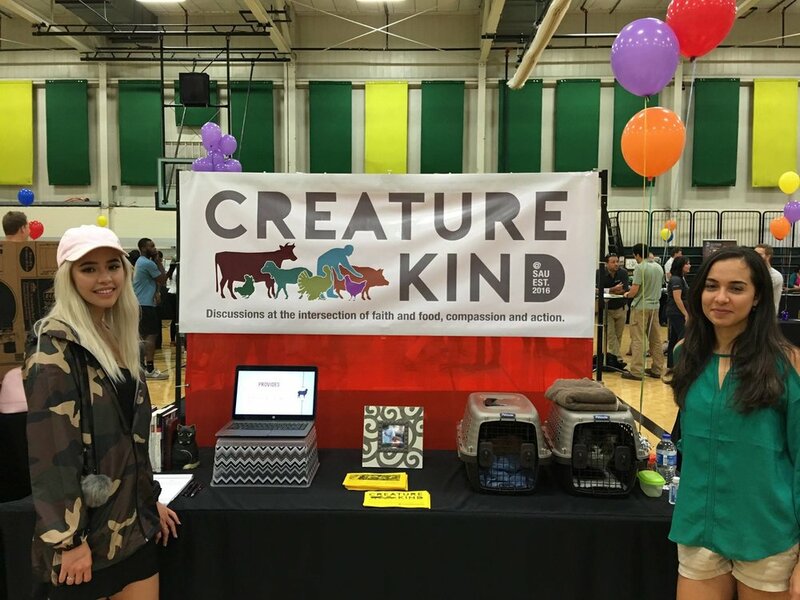 CreatureKind Affiliates are teams of two or more people who are working to raise awareness of farmed animal welfare issues in their communities. Each year, the team agrees on three conversation-starting actions, signs the CreatureKind Action Plan, and sends the plan to CreatureKind so we can help spread the word. Pick from our suggested list of actions (i.e. host a speaker, preach a sermon, virtual classroom visit, staff/faculty brief, friendly food challenge, host a chef training, conference workshop or track, resource development, etc), or come up with your own. The University of Winchester was the first CreatureKind Partner Institution. CreatureKind Partner Communities commit to reducing consumption of animal products over a two-year period. They may do this by adopting a Default Veg policy or by aiming for a mutually-agreed percentage reduction. Partner Communities also commit to sourcing a percentage of remaining animal products from certified higher-welfare sources, and to supporting highest-welfare farms. Photo: Friends House / Quaker Centre Cafe. The CreatureKind project is motivated by a Christian recognition of animals as fellow creatures of God and the conviction that when humans are kind to animals and care well for the world, God’s entire creation benefits. It’s a win for the environment, a win for animals, a win for humans, and a win for the health of our communities, when we—individually and corporately—reduce our consumption of animal products and move to buy the animal products we do consume from higher welfare sources. Plant-forward menus can save money, reduce overall greenhouse gas emissions, contribute to improved health, and reduce our reliance on factory farmed animal products. When we purchase animal products from certified higher-welfare sources, we support farmers and families who are working like mad to do right by the earth, by their workers, by the land, and by animals. Most importantly, when we include animals on our agenda, we honor our call to care for the whole earth, to anticipate the peaceable Kingdom of God, to share the peace of Christ with all of God’s beloved creation, and to love our neighbors well. To learn more and take the first step, please contact us today.